Carefully selected by European buyers and stylists, Veneta offers the latest trends in the Australian Curtain market. Choose from Double Pinch Pleat, Reverse Pleat or Wave Fold header styles and browse our large selection of designer fabrics to suit all budgets. Not only do curtains add a touch of elegance to any room, they also offer excellent insulating and sound-absorbing properties. Buying your modern curtains online in Australia is a stress-free way to upgrade your window coverings. With Veneta Blinds Zero Risk Guarantee, you can be confident to DIY measure. Modern curtains are a great solution for every home and now you can order your modern curtains online, stress-free. If you accidently make a mistake with your measurements, we will simply resend you a replacement curtain free of charge at the new size. Feel comfortable buying your modern curtains online at Veneta Blinds! Sheer curtains are the perfect way to transform a space and buying curtains online is a great way to get the style you want, without the price tag. Choosing a sheer curtain type doesn’t have to be tricky. Simply select ‘sheer curtain’, order free colour samples, choose your customisations and input your measurements for an instant quote. You can easily customise your sheer curtains with Veneta Blinds! Blackout curtains are made with a fabric that helps to blockout sunlight, street lights and offers 100% privacy. The blackout curtains also have excellent insulating properties and help to regulate room temperatures. For optimal temperature regulation with blackout curtains, on hot summer days keep blinds drawn and open them up at night to allow the cool breeze in. Similarly, on cool winter days, open the curtains up during the day to allow the winter sun to warm the space and close them before it gets dark to trap the warmth inside. When it comes to custom made curtains, there is an option to suit every home. 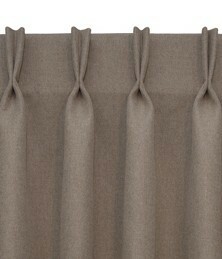 We offer a range of custom made curtains from double pinch pleat, reverse pleat or wave fold. You can also choose from sheer, light filter, dim out and blockout fabric, or choose a combination of two. All curtains are custom made to your exact measurements, chosen customisations, and are delivered directly from our factory to your home within 14 days.